It is the last day of November and the countdown to Christmas is officially on! 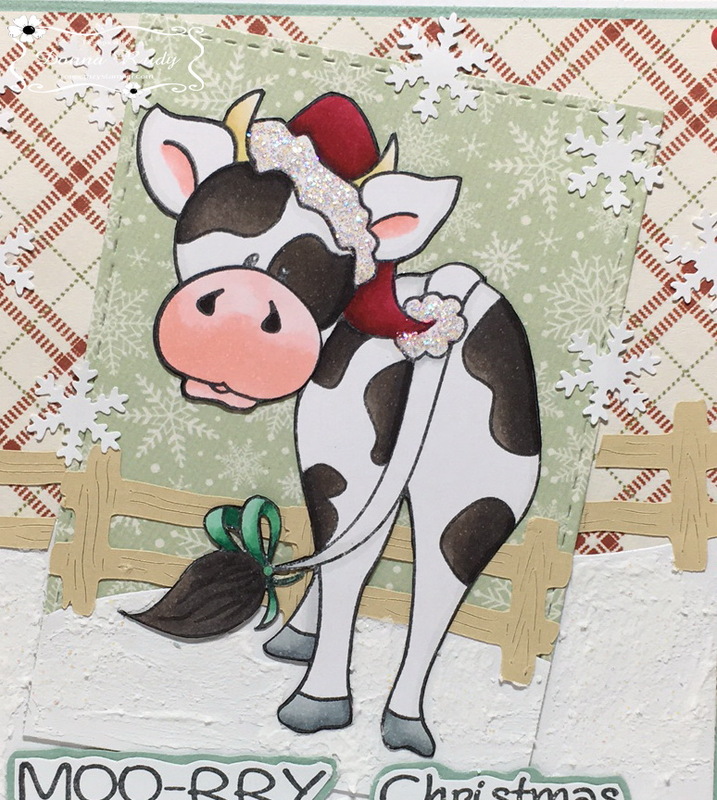 My card today features Charlie, one of my fav animals from the new Fall/Winter release. 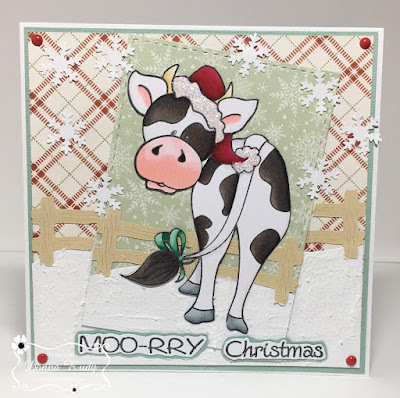 This stamp is called "Charlie's Moo-ry Christmas" and I have paired it with the "Moo-rry Christmas" sentiment. I coloured the stamp with alcohol markers and limped my badly worn out cuticle scissors around the image to fussy cut it. A fence cut out with my Cricut and some snow banks helped my put together my scene. Glitter snow was added to the snow banks to add some texture. A few snowflakes and some gumdrops finish off my card. We will have a new Challenge starting tomorrow! Be sure to pop by and see what the design team has created! Well the last Tuesday of November has arrived, which means we are a day closer to Christmas. I am so not ready for the holidays. For my post today, I have used this adorable stamp from High Hopes Rubber Stamps Fall/Winter Fun release, called Polar Friends. There is still a bit of time to enter this month's challenge for a chance to win 2 unmounted High Hopes Rubber Stamps of your choice. Do pop by on Thursday, December 1st as OCS will have a new challenge along with a new release from High Hopes Rubber Stamps. For any supplies that you need or would like check out Lora's OCS store. 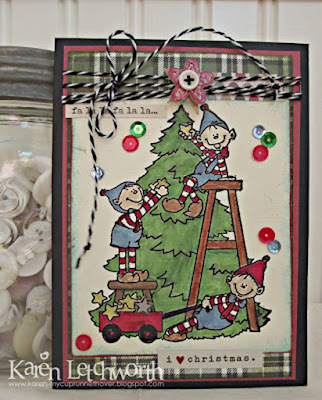 Hello friends, I another card I am sharing with you for our challenge here at One Crazy Stamper. 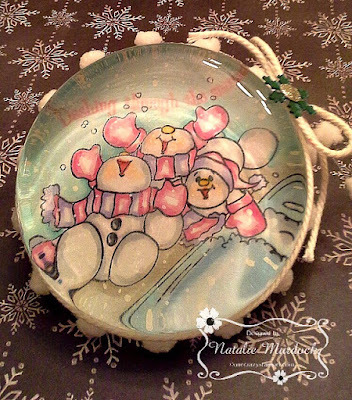 Using the fun stamp from High Hopes Stamps new Winter/Fall Fun release called All Wrapped Up, and the sketch as well. I hope you can play along with our challenge and stop by Lora's store and check out the supplies there too, and till next time, happy crafting. Copic Markers, Circle Dies, Memento Ink, Lawn Fawn Pattern Paper. Karen Letchworth, OCS' Saturday Guest Designer is back with another adorable card, using the adorable stamp called Downhill Snowy from High Hopes Rubber Stamps. Hello, friends! 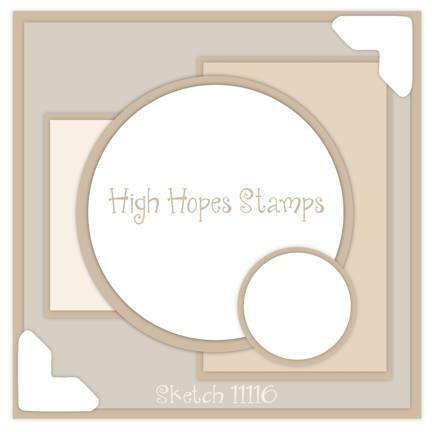 Today I'm posting again as part of a Guest Design spot for One Crazy Stamper to promote High Hopes Stamps and the other wonderful products they carry. For today's card, I have used a sweet High Hopes Stamp called Downhill Snowy. Isn't he cute? I stamped him in black and embossed him. Then, I stamped him again to layer the colored parts of his body, such as his hat, jacket, etc. For the downhill slope, I used some Diamond Stickles to help make it look more like real snow. I water colored the background of the image several times to give it the look of cold, blowing Winter winds. 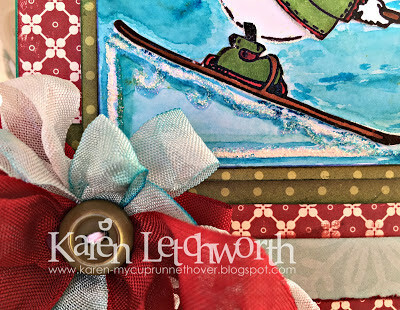 I added a small chipboard sentiment at the top left, and a big seam binding bow at the lower left that has a coordinating green button in its center that's tied with a piece of Icicle Metallic Baker's Twine. 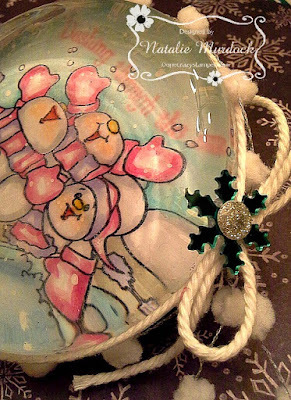 I really wanted to make this sweet stamp the focal point of the card while also giving it some sweet embellishing. The Downhill Snowy remains the real star of this card. 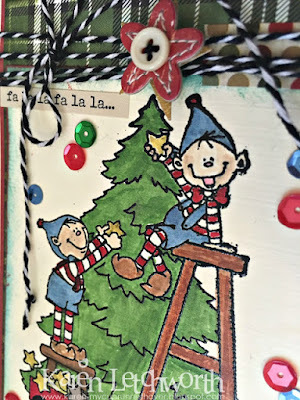 I hope that you will stop by the One Crazy Stamper Blog for more great inspiration, and to check out their fun challenge. 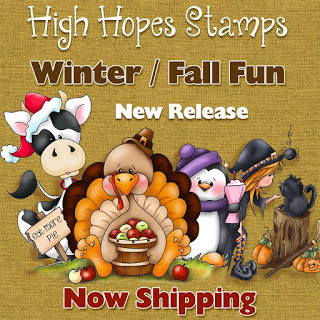 There are lots of great High Hopes Stamps to see, as well as all sorts of other great products. Thanks for stopping by. It's another week closer to Christmas and another Christmas card ready for the mail! High Hopes Jingle Jangle found here! The image is coloured with Copic Markers, I used a white sharpie marker to create the background snow. 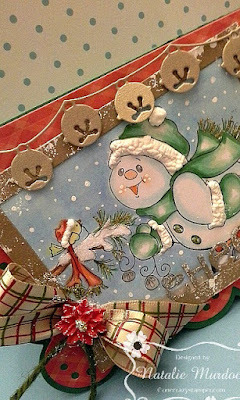 Liquid applique, and fine white glitter was also used to help with this snowy scene. Thanks for peeking, have a crafty weekend! 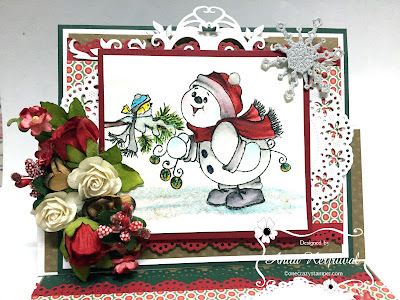 This is Anita here , with another lovely inspiration from One Crazy Stamper. The High Hopes Stamps are super gorgeous and there is one for every occasion. christmas is just a month away and there is loads to do. Car making is in full swing all around the world and I am loving each one of them. Today I have a super cute card with a lovely High Hopes Stamp from the OCS store. It is an easel card with lot of flowers. Cut white card stock to the size 7 inches by 12 inches. Score at 6 inches and 3 inches on the longer side. Fold like an easel card. Cut the second matte layer in white card stock to size 6 inches by 5 inches. Adhere green card stock at the back leaving 4mm all around. Adhere Brown dotted card stock on the easel card base and on the matte layer. Adhere decorated pattern paper cut with doily punch. Stamp the image on water colour paper and colour with Zig markers. Highlight with glitter. Adhere on to the card front. Add the sentiment at the bottom on another die cut. Arrange mulberry flowers on front and base. A fabulous Challenge with High Hopes stamps is going on at the OCS blog. It is a sketch challenge and you can find all details here. Thanks a lot for stopping by. Have a wonderful day!! It is the last week of November which means Christmas is fast approaching. I won't give you the weeks away count - if I do I will go into panic mode lol. I am in full out Christmas card making mode - especially because I have my first family Christmas dinner in a week and I will need 5 cards! Yikes! The layout is based loosely on this month's challenge sketch. 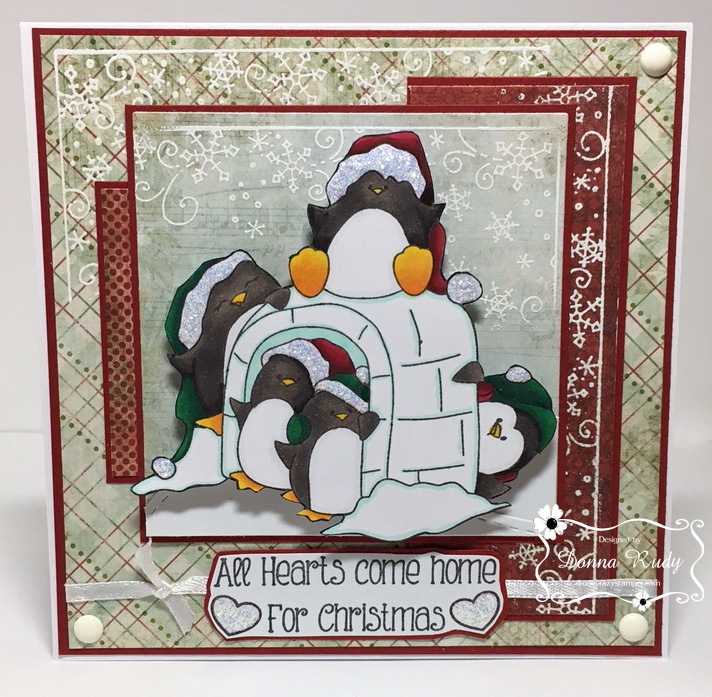 I have used a number of stamps from High Hopes Stamps: "Penguin Family Igloo" and the "All Hearts" sentiment from the new Fall/Winter release as well as a stamp called "Winter Wonderland Background". 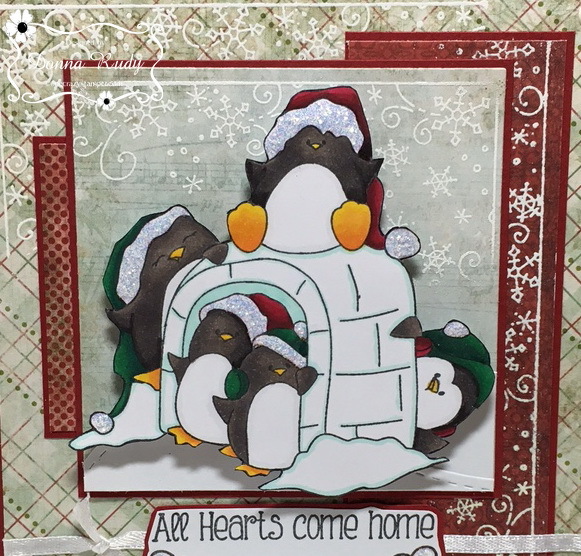 I coloured the stamp with alcohol markers and then you got it - pulled out my cuticle scissors and fussy cut this cute penguin family. There are four kids in my family and believe me - every one of these penguins is "one of us"! 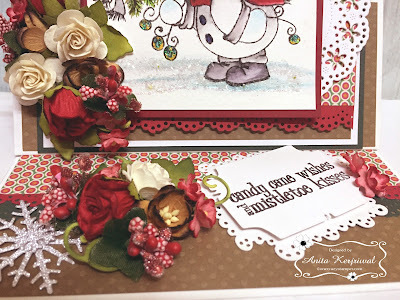 After cutting my patterned paper pieces, I used the top of the Winter Wonderland Background stamp to create the border on some of the edges with white embossing powder. Stickles were added to the hats on the hearts on the sentiment for a little bling. 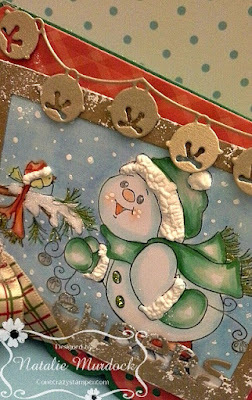 Some ribbon from my stash and white gumdrops finish off the card. Our November Challenge is Fall/Winter Fun and there is a sketch to get your creative juices flowing. There are still a few days left! Click here to play along - we can't wait to see what your create! Sending you Loads of Wishes!!! Hi there and welcome back fellow OCS fans. It definitely looks like winter has blown in with a bit of blast in some areas. For my card today I have used this adorable stamp from High Hopes Rubber Stamps Fall/Winter Fun release called All Wrapped Up. I used Copic Markers to colour the image and added some Polar White Flower Soft and Nuvo White Blizzard Glitter Drops. There is still time to enter this month's challenge for a chance to win 2 unmounted High Hopes Stamps of your choice. 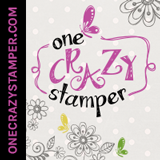 For any supplies that you might need or want check out Lora's One Crazy Stamper (both online and the brick and mortar) store. Don't forget to make your list for Santa. 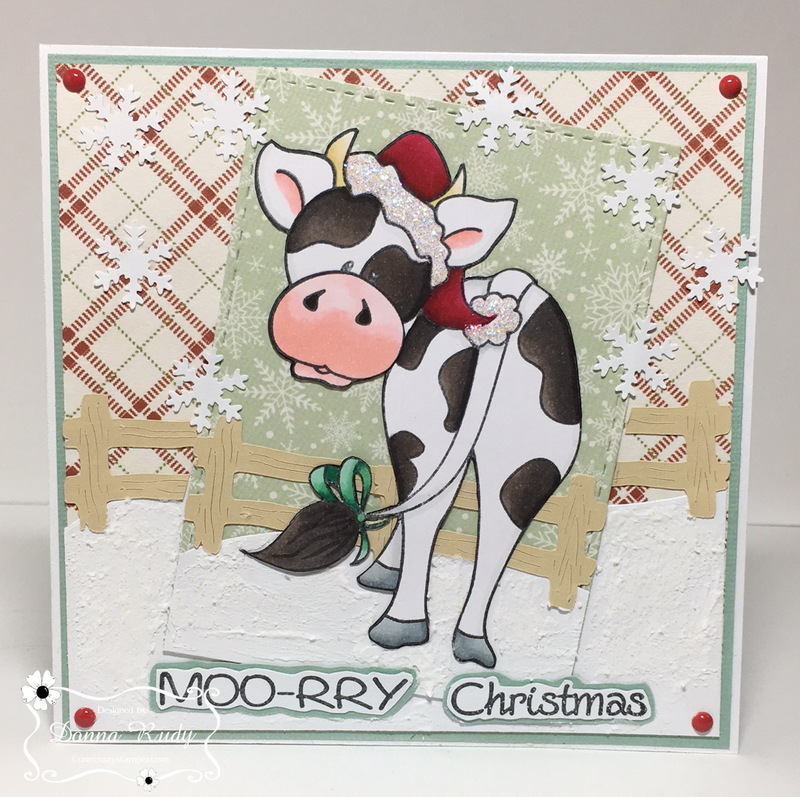 Hello friends and welcome back, so happy to share with you, my next card for the fun challenge we are having here at One Crazy Stamper. 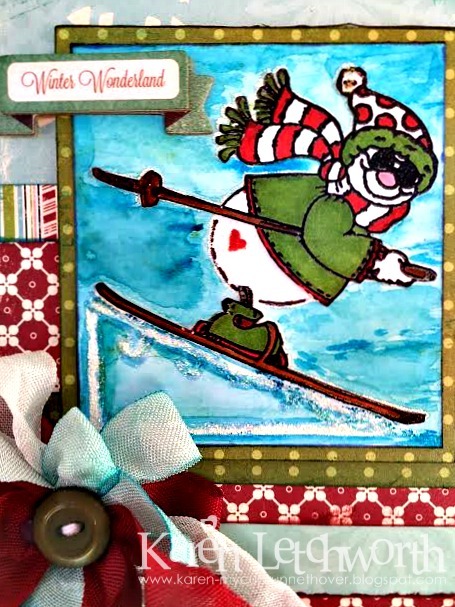 We are sharing the new release from High Hopes Stamps - Winter/Fall Fun. As well as an option to this challenge we have a fun sketch to go along with this. I hope you can play along, and Lora has some wonderful prizes and fun supplies in her store. 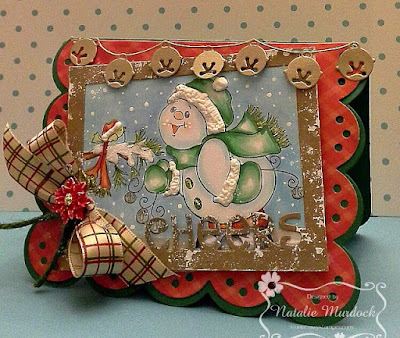 So stop by and now here is my card, till next time, Happy Crafting. 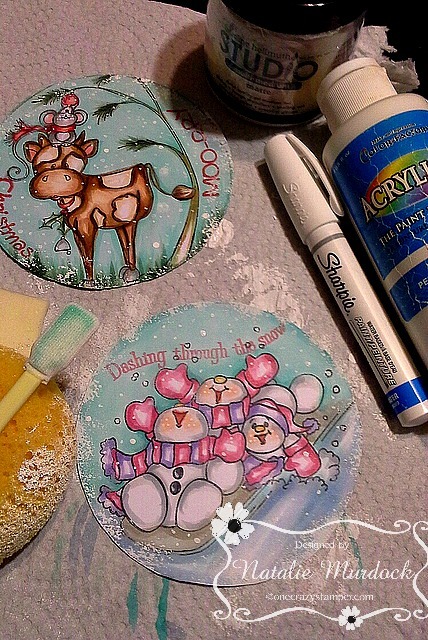 Sparkle Gems, Snowflake punch, Circle Dies, Foam Tape. Karen Letchworth, OCS' Saturday Guest Designer is back with another adorable card, using the adorable Decorating Elves from High Hopes Rubber Stamps. I don't know about you, but I sure hope that the Christmas Elves show up at my house to decorate. This is one task that, quite honestly, I don't enjoy. I'd really appreciate the help of these adorable Christmas Elves to do the job. Wouldn't you? 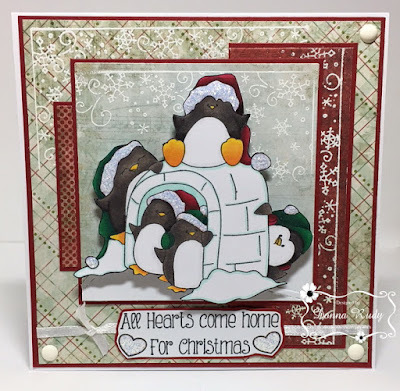 One Crazy Stamper has so many great products including High Hopes Rubber Stamps, and they also have a fun challenge on the One Crazy Stamper Blog where you can play along to win prizes. 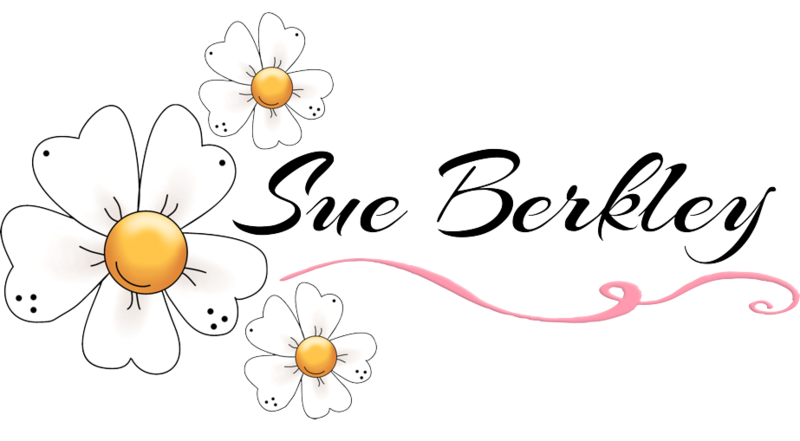 Check out this fabulously fun store, and treat yourself to some adorable new stamps and goodies. Hi there, It's another Happy Friday and I'm back to share a few handmade presents I made for Christmas. 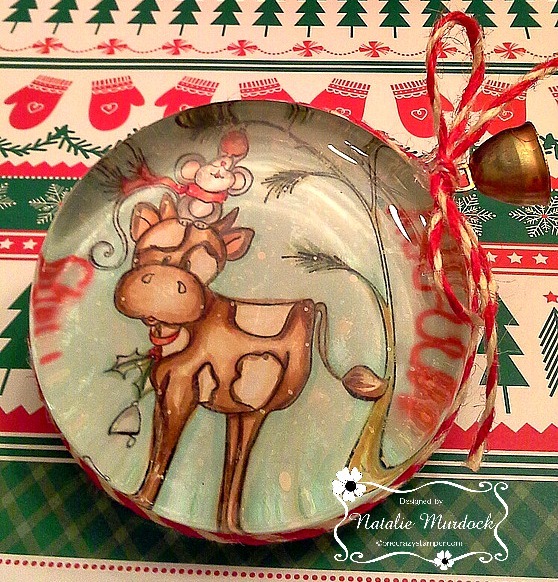 High Hopes Decorating with Charlie found here! 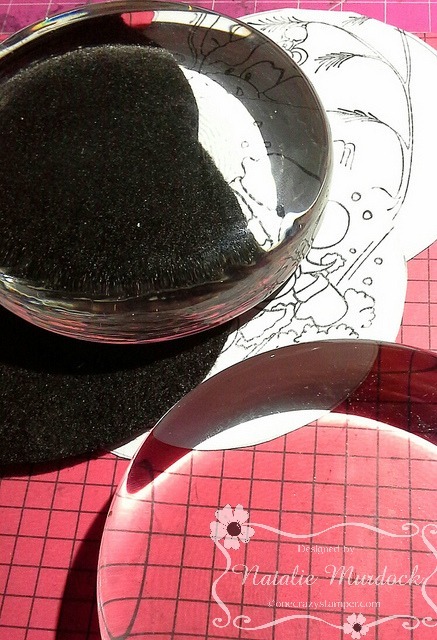 To create these paperweights I used these glass blobs (I think they are actually called "Glass Blanks" They are nice and heavy and I think will make a good paper weight . The Images were coloured with Copics, added snow using acrylic paint and a Sharpie marker. 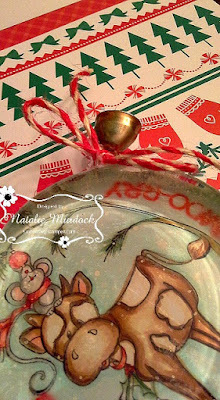 The image was stamped in distress ink and if I make these again I would use Memento Ink as it did smear slightly. Matt medium was brushed on the the tops of the image and adhered to the bottom of the glass base. 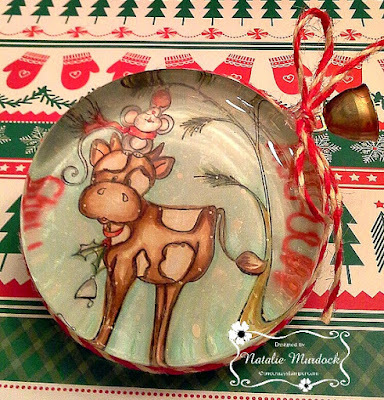 For the Christmas Cow I Stamped the sentiment in two parts on either side of the design. Oh, and I added some candy cane twine and a Cow bell too! This time I used some super soft cotton twine and an added snowflake. And a close up ! Thanks for peeking. Have a great weekend! 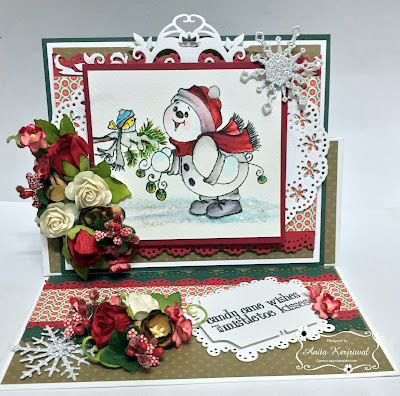 Do join this month's Fall/Winter Fun challenge for a chance to win 2 unmounted High Hopes Rubber Stamps of your choice. 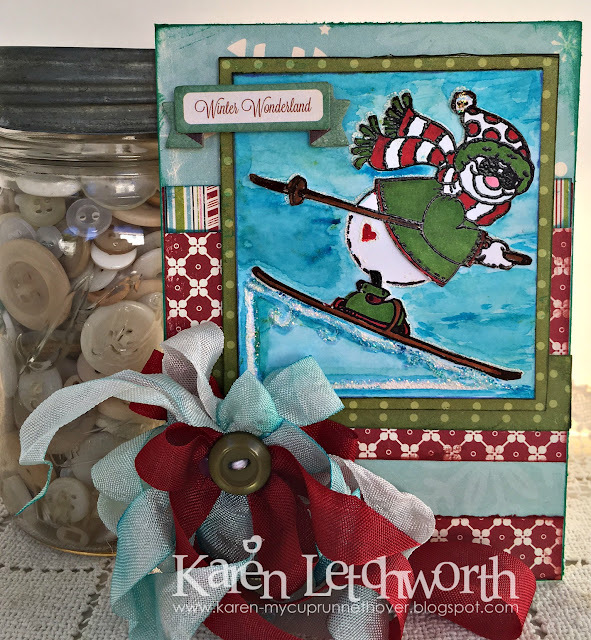 Dashing through the snow -- High Hopes Stamps!